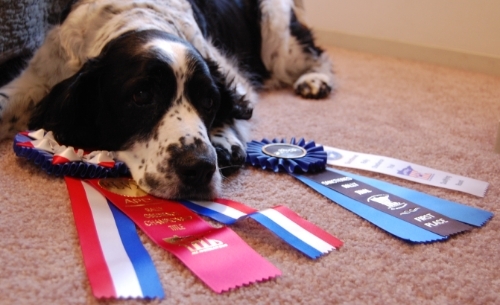 Buzz earned his RLVX today with a 209/210 and 1st place (yes, he did even beat another dog). Sometimes runs feel like gimmes in any venue, but Buzz worked his darn heart out today. I've been wondering for a couple years what kind of tattoo I'd like to get in honor of him and haven't come up with anything. Today I decided I need to get more words. Specifically, "To Infinity and Beyond." Video of our run: Buzz RLVX! Buzz is seriously the sweetest, most adorable old man on four legs. He's just the coolest and you're amazing for keeping it up with him for so long. That is a fantastic tattoo line. Congratulations . That is a great achievement. Congrats to both of you! Way to go Buzz! Infinity & Beyond is perfect. So, I got "bullied" into entering him in another run today. He got another Q and first place and somehow managed to get High Scoring MMBC Member Dog. So, out of all the club members there, his score was the highest. Heh. He actually moved better today than he did yesterday, but I didn't bring my Flip with because I wasn't actually going to run him. What a good, good boy.